If you're getting antsy that Microsoft's Windows 10 Technical Preview hasn't seen an update since late January, you're not alone. After an early leak, Microsoft has confirmed that it will be increasing the pace of new build releases for Windows 10. Microsoft General Manager of the OSG Data and Fundamentals team Gabriel Aul confirmed on Twitter that the company is testing a new build candidate internally. After that testing is finished, Microsoft would roll out the new build to preview customers, but Aul did not give a timeline for when that will happen. "We have a good build candidate with some new features I think you'll like," Aul said in a Twitter post. "Running through our internal rings now." Update: In a recent interview with Neowin, Aul told the site that intends on updating builds for the Windows 10 Technical Preview at least once monthly. "Aul said that they will not commit to anything more than one release per month but based on the new workflow for builds to be released, there will be more candidate builds of Windows 10 put to vote for Insiders," Neowin reported. "More so, Aul cannot say when each month a build will be released as there are far too many variables about when a build is ready for consumption." Microsoft also released Build 10041 today to Fast ring users. At this time, Microsoft allows Windows 10 Technical Preview customers to choose how often they receive updates. More adventurous customers who prefer to experience new features and functionality ahead of everyone else could join the "Fast" ring, while users who want a more stable experience can choose the Slow ring. Fast ring customers will get to see updates first, but because the software is still in the technical preview stage, all the bugs may not be worked out. Slow ring customers trade in the experience of being first to try out new features with a more reliable build. As Microsoft is increasing the rate of release of new builds, the company is advising customers to move over to the slow lane if they want a more stable experience. "No new build today, but we will be posting an announcement in Insider Hub. Suggesting people who want lower risk to move to Slow," Aul cautioned. "For now we've decided to try to increase pace of Fast, and that means letting people know first." If you're a business or enterprise user, or if you're running Windows 10 Technical Preview on your only computer, you likely want to move to the Slow ring. 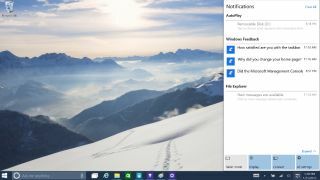 If you're not in a rush to try all of the latest features and additions to Windows 10 Technical Preview in the Fast ring, you can pull over and move to the Slow ring. From your Windows 10 system, click on the Start Menu and choose PC Settings. You'll want to choose the Update and Recovery option, and navigate to Preview Builds. From there, you can choose to go with the Slow or Fast build. Aul's comments apply to Windows 10 for tablets, laptops, and desktops. Updates for the Windows 10 for phones technical preview will roll out on a different schedule.